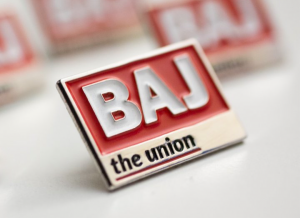 The British Association of Journalists (BAJ) is the union of choice for journalists, both staff and freelances, working within newspapers, magazines, broadcasting and online media. We welcome members who earn an income from being part of an editorial workflow process, encompassing reporters, hyperlocal editors, photographers, writers, sub-editors, page layout artists, news broadcasters and many other varied roles associated with the journalism Industry. Direct and prompt access to specialist legal advice on employment issues including disciplinary, redundancy and discrimination. Representation at employment hearings and support throughout litigation in the court or the tribunal if necessary. Specialist copyright, intellectual property advice and litigation. 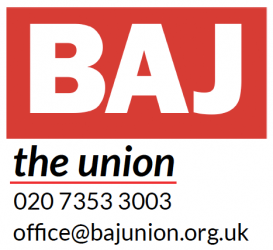 The BAJ is the recognised union for a dominant UK newspaper group. We negotiate robustly for the best outcomes for our members and members of a bargaining group. We believe that BAJ is the best value for money union for journalists. We are streamlined, efficient and diligent having built a reputation for being responsive, caring and professional with a determination to ensure that our member’s rights and individual needs remain protected in our ever-changing and evolving industry. Make the BAJ your Union today. * ‘UK Press Cards’ are issued subject to meeting strict criteria laid down by the UK Press Card Authority. While the BAJ is a Gatekeeper for the scheme, membership of the BAJ does NOT guarantee entitlement or qualification for the issue of such. The BAJ is proud to announce our new campaign to end the unjust and unfair practice of Payment on Publication (POP) employed by newspapers and magazines, causing real hardship for freelance contributors. BAJ says this practice must stop and with your help, we will demand an end to POP by publishers.